Summary: The Aquatic Animal Health Program (AAHP) within the University of Florida, College of Veterinary Medicine works collaboratively with sea turtle programs throughout Florida. Veterinarians, students, and other vital AAHP personnel have assisted with response to several large mass stranding and mortality events, as well as the recent Deepwater Horizon oil spill disaster. This proposal is for funds to purchase a truck designated for sea turtle veterinary use. A suitable vehicle is critically needed to facilitate field response and to service a diagnostic/research facility, which is regularly used for sea turtle examinations performed in consultation with the Florida Fish and Wildlife Conservation Commission. This vehicle would directly enhance operations that benefit state and federal sea turtle program goals related to sea turtle health and impacts from human activity. Results: The vehicle was immediately put into service upon receipt in September 2012. To date, 66 trips have been logged into the vehicle use record, totaling 4,073 miles. 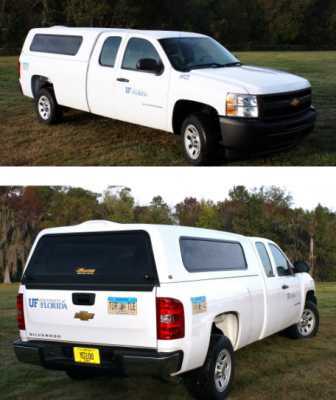 As proposed, the truck is invaluable to servicing a joint NOAA/University of Florida sea turtle research and diagnostic facility on the UF campus. Operations, which include sea turtle health surveillance, identification of causes of mortality, and collection of samples for sea turtle researchers, have been greatly facilitated by this vehicle. In addition, it was used to transport materials for a teaching laboratory for stranding responders at the Turtle Hospital in Marathon, Florida in December 2012, deployed in response to a sea turtle mortality event in the northern Gulf of Mexico in the spring of 2013, and was used twice in support of a long‐term field project studying loggerhead sea turtles in the Everglades National Park in March and June of 2013. The decals have elicited numerous inquiries on sea turtles and the STGP from the public.